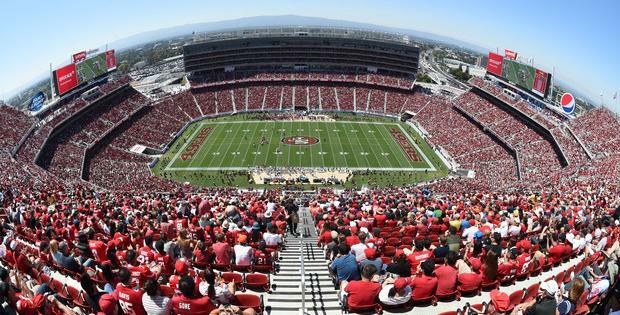 The new Levi's Stadium, home of the San Francisco 49ers, is deploying new wireless beacon technology that lets fans use a special stadium navigation app on their smartphones and other devices. The beacon signals, which have been in use since Aug. 2, run over Bluetooth Low Energy (4.0) and are being used in conjunction with the 68,500-seat stadium's vast Wi-Fi and switching infrastructure. "We were able to blaze new ground and create a platform that gave our fans the experience of a personal game day command center in the palm of their hands," said Dan Williams, the football team's vice president of technology, in a statement. The overall network relies on switching equipment from Brocade Communications as well as Wi-Fi and beacon technology from Aruba Networks. With the app, fans also can watch instant replays and order food directly from their mobile devices, much the same way as in newer sports venues in Dallas and other U.S. locations. What is perhaps most novel in the approach at the Levi's Stadium is the use of about 1,000 Aruba beacons installed throughout the 1.85 million-square-foot stadium atop hundreds of Wi-Fi access points. The beacons, which are about the size of a hockey puck, use the iBeacon proximity protocol first released by Apple in iOS 7 and deliver signals over Bluetooth LTE (4.0) wireless. A beacon in the stadium sends out a Bluetooth signal that can be received by a user's Bluetooth-enabled device running either iOS or Android, but users have to opt-in to communicate via a special stadium app. The beacons have a few advantages. Among them is a three-stage opt-in process that's designed to protect users' privacy and ease concerns about being tracked via Wi-Fi, said Jeff Hardison, Aruba's director of public facing enterprises. Another advantage is that IT managers can monitor the functioning of the beacons, including whether they are powered on or need a battery, through the beacon signals combined with the Wi-Fi network, Hardison said. Aruba developed Aruba Mobile Engagement software to help IT managers enable such beacon monitoring through an Aruba Meridian network management console. Aruba also provides a software development kit for building mobile apps that rely on the beacons, such as the app available at Levi's Stadium. Williams would not disclose the cost of the beacons and other network installations but said via email that it was "less than most would expect." Installing the beacons and other network elements was "definitely complex," Williams added. His team was able to test a few engineering concepts at the old Candlestick Park in San Francisco and found such preparation helped when Levi's Stadium was operational a few months prior to the Aug. 2 opening. "We were pretty well-prepared to deal with issues which required tweaks," he said. The wireless service provided to users at Levi's Stadium is "expected in this day and age," Williams said, but that doesn't diminish the complexity of the work and the two years of preparation. "A tangible difficulty was developing a solution for a building that was not constructed, and when it finally was complete, there was no real way to fill it up with people until our first real event on Aug. 2," he added. "Doing our homework and making educated guesses just about worked. Tweaks were needed, but we felt really good about the solution after the first event." Williams said the experience convinced him it's important to "expect the unexpected and take risks." For Aruba, the Levi's Stadium project is a valuable case study to prove its beacon technology prowess, including both hardware and management software. The company also has projects for beacons underway at the American Museum of Natural History in New York, Orlando International Airport and the Nebraska Furniture Mart. Aruba's Hardison said the museum used an indoor Wi-Fi-based positioning system starting in 2010, but decided to move to beacons to help users with building navigation. The beacons, he said, provided users with greater accuracy and a better experience with the app. With the app at Levi's Stadium, a blue dot on a map can move more accurately because of the beacons, he said. Beacons are also more affordable than Wi-Fi access points (APs) , a factor that is likely to help in their adoption. An industrial-grade Wi-Fi AP can cost $500 to $1,000, while a single beacon can cost $25 to $30, Hardison said. Aruba hasn't announced exact prices for its beacons, which will come either as battery-powered or with a USB connector that can attach to a Wi-Fi AP for power. Pricing for the Aruba beacons will be announced in the first quarter of 2015. Also in that quarter, Aruba Mobile Engagement software ships. That software will be a free upgrade for Aruba Meridian customers.